Covered by WGN9 Chicago. Click here to see the web post. CHICAGO – Members of several communities came together Monday at the DuSable Museum on Chicago’s South Side to honor the victims of the shooting at a Pittsburgh synagogue. Faith leaders and civil rights activists gathered to show support for the Jewish community in the wake of the deadly attack. The group also demanded that the vast majority, so often silent, start speaking out against hate and division. The broad array of black and white, Christian, Muslim and Jewish leaders gathered to condemn the hate-fueled massacre of Jewish worshipers at the Tree of Life synagogue in Pittsburgh, the deadliest attack against Jews in American history. It was a call for unity combined with an urgent plea to connect the dots between the hysterical, irresponsible and false rhetoric of the president, and the violence of extremists inspired by his angry vilification of immigrants and political opponents and his moral equivocation on white supremacists and Nazis. Over the past two years, anti-Semitic attacks have more than doubled, according to the Anti-Defamation league. “The failure of society at large to see what Jews have seen has led us to this very dark and frightening place,” Alison Pure-Slovin of the Simon Wiesenthal Center said. Reverend Mitchell Johnson issued a powerful reminder that hate speech must be countered with thundering disapproval. 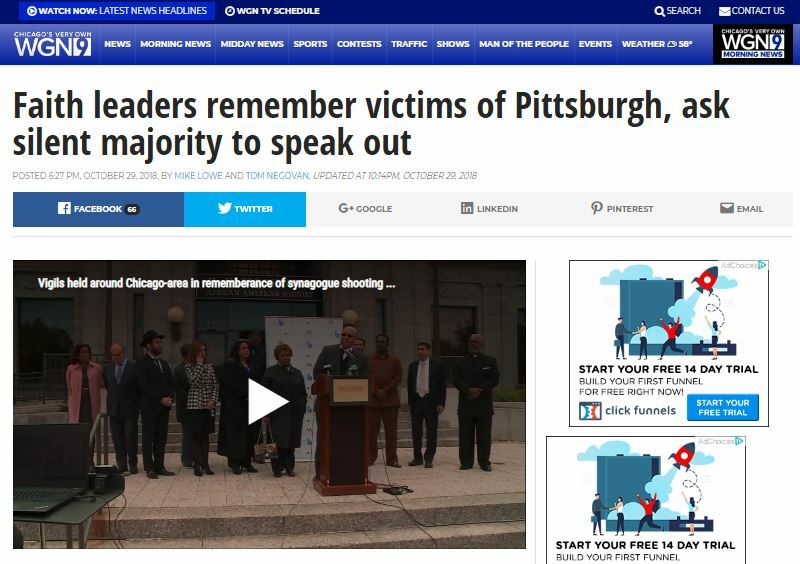 Pastor James Moody of the Quinn Chapel Ame Church warned that fringe voices, conspiracy theorists and extremists, have all been amplified and drowned out quiet conscience of the country. He said the Pittsburgh attack must be a turning point away from the poison of division.